Some of these signs can actually be good so you shouldn’t get discouraged should they crop up! Sure, you’ve seen your date’s photo on his or her profile—but when you meet face I never thought my soul mate would come in a package like his, but it happened. to face, you realize the person is so not your type. “Next!,” you say? Not so fast. “Remember that there are thousands of happy couples out there who are not each other’s type,” says Janice MacLeod, co-author of The Dating Repair Kit. By ruling out someone just because he or she does not meet your romance requisites, you are cutting yourself off from a world of possibilities. If your date tells you he or she is dating other people, just be happy no secrets are being kept from you. (After all, it’s better to know now than later.) However, if the bombshell your date drops is more of the “I’ve cheated on every person I’ve ever been with” variety, this is a major red flag, according to MacLeod. Beware. You’re having a nice, normal, getting-to-know-you conversation when suddenly you have a difference of opinion. What begins as a friendly disagreement quickly escalates into an all-out fight. Whether you’re arguing over politics, religion, or even the merits of VH-1’s Celebreality lineup, an argument on a first date never feels like a good sign. But a fight can actually be a very good thing. If you’re arguing, it can mean there’s passion between you. Sparks are flying—sure, maybe not in the way you’d hoped, but they’re still there. “Arguing can lead into interesting conversation, which is part of what keeps a relationship alive,” says MacLeod. When 28-year-old Noah, of Burbank, CA, met Lillian, they instantly clashed. “It felt like we couldn’t see eye-to-eye on anything that first date,” he recalls. “She was a vegetarian, and I ordered a rib-eye. An hour-long debate on animal rights ensued.” Despite the meat melee, their connection was still meaty enough to merit a second date. “She was my opposite, sure, but being with her was never boring,” he says. If your date spends the whole time you’re together shooting questions at you rapid-fire and giving you the hard sell, it could just mean that he or she is impressed by you and is simply trying too hard, says MacLeod. That was the case for Mark and Jackie: “Once I ‘passed’ her pre-screening interview, she let her true self come out—and that’s when we actually started to have some fun,” he recalls. When your date is grilling you, attempt to turn it around and ask some questions of your own. That way, it won’t feel so one-sided. If you have a second date, MacLeod suggests catching a movie. “That way, you won’t have to talk the whole time,” she says. After your first-date talkfest, it will be a nice break. In the absence of a smooch, look for other signs of attraction. Does your date make eye contact, give you undivided attention, and make you feel like you’re the only person in the room? In this case, actions speak louder than… action. Hang in there, and you may well be smooching in no time. Julie Taylor has written for Cosmopolitan and Redbook, and is the co-author of "How to Be a Dominant Diva." She and her now-husband’s first date was less than perfect—but she’s eternally grateful she gave him a second chance! Launched on the Web in April 1995, Match.com is at the forefront of a cultural shift that has fundamentally changed the way people connect, communicate and find love. At the click of a mouse, singles have instant access to connect with other singles, which is why it has led to more dates, more relationships and more marriages than any other site. Relationships, Match.com. 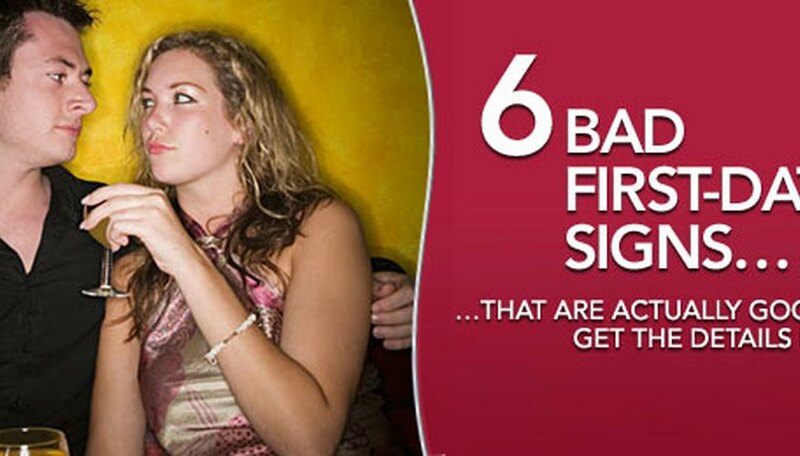 "6 Bad First Date Signs." Dating Tips - Match.com, https://datingtips.match.com/6-bad-first-date-signs-13392412.html. Accessed 20 April 2019.